Only TSI DustTrak DRX Aerosol Monitors can simultaneously measure both mass and size fraction - no other monitor can do both. DustTrak DRX monitors are battery-operated, data-logging, light-scattering laser photometers that give you real-time aerosol mass readings. They use a sheath air system that isolates the aerosol in the optics chamber to keep the optics clean for improved reliability and low maintenance. The DustTrak DRX Model 8533EP is outfitted with an external pump module that is designed to handle the rigors of continuous 24/7/365 monitoring applications such as construction sites and fugitive emissions monitoring at environmental sites, as well as other outdoor applications. 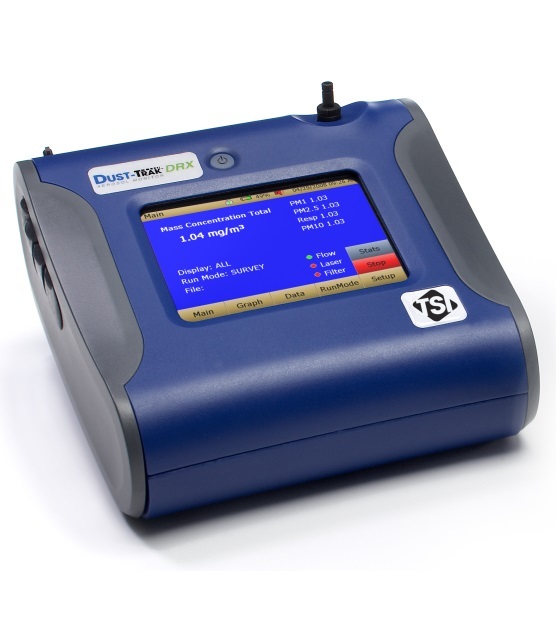 The DustTrak DRX Aerosol Monitor measures aerosol contaminants such as dust, smoke, fumes and mists. 8533EP Includes: Carrying case, External Pump Module (with Power Cable, Flow Adapter and Flow Tube), Rechargeable 7800 mAH Li-Ion Battery, Switching Power Supply with Universal Plugs, TrakPro Data Analysis Software CD, zero filter, USB (device and host) computer cables, analog/alarm outputs, analog/alarm output connector, inlet cap (2), 37-mm cassette with mesh filter, calibration impactor kit (with PM2.5 impactor, impactor plates (2) and impactor oil), sample extension tube (3-ft/1-m), sheath air HEPA filters (4), filter removal tool, operation & service manual, calibration certificate and 2-year warranty. 800663	Zero filter. Qty 1. 801681	Battery, 3600 mAH Li-Ion, for Handheld DustTrak 8532, 8534. 801680	Battery, 7800 mAH Li-Ion for DeskTop Models 8530, 8530EP, 8533, 8533EP. 801674	Impactor Oil for DustTrak II/DRX/AM520/AM520i; 5 ml bottle.